Ghaznavid art takes its name from the dynasty founded by the Turkish sultan Sabuktagin, whose rulers governed from Ghazni (in what is now Afghanistan). Craftsmen and artists were attracted from the conquered lands, primarily from the lands of the Islamic east, to beautify the capital. Unlike the Samanids, their predecessors the Ghaznavids did not go so far as to proclaim themselves the descendants of the Sassanians (the memory of their Turkish origin was too fresh), but they spoke Persian, celebrated pre-Islamic festivals, and promoted neo-Persian letters. The fact that elements foreign to Islam and Persia were also present at Ghazni poses the question of the extent of their influence on Ghaznavid art. Ghazni was the meeting ground between Moslem and Indian worlds. Indian monuments certainly left an impression on the conquerors, and there were numerous groups of Indian craftsmen at Ghazni; however, there is insufficient documentation to indicate an Indian contribution to Ghaznavid art. Ghaznavid architecture provided one of the best examples of how decoration was considered to be as important as the structure itself. As well as providing the structure, brickwork was used to provide geometric patterns. Marble was used extensively in Ghazni and virtually surpassed stucco. Sources say that it was used for the facings of the mosque "Bride of the Sky", whose splendour rivalled that of the mosque at Damascus. However, the Ghaznavid's use of sun-dried bricks combined with the severe climatic frosts resulted in the ruin of most of these buildings. 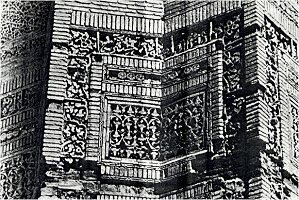 Two details of the brick decoration, Ghazni, 11th century. 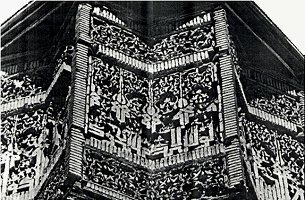 In the palace of Mas'ud III, the design was greatly enriched by the insertion of molded terra-cotta tiles, as well as what appears to be ceramic plaques decorated in reliefs with figures of wild beasts, birds, and flowers, all glazed over in green, brown and yellow enamel. Today only fragments have been found in the ruins, and they are preserved in the Kabul museum. An innovation of great importance, because it was to become a classic formula in Persian architecture, is the so- called 'cruciform' mosque plan, a court with four iwans. This formula was widely adopted not only in mosques, but also in the construction of madrasas, the schools in which the Koran was taught. Like the Abbasids, sources suggest that the use of the human figure in wall paintings was widespread in Ghaznavid buildings. Lashkari Bazaar, the palace, 11th century. The only remaining frescoes, found in the palace at Lashkari Bazaar show a row of 44 personages (the ruins of two pillars suggest that the original total may have been 70) wearing tunics, of which only the neck is visible and a long cloak fastened at the left. The bodies are depicted frontally and the feet in profile. Similarities can be drawn to that of Persepolis or Susa where it was customary to provide pictures of the men who guarded the palace. Turkish elements had an influence on Ghaznavid painting; however, this influence is not limited to Ghaznavid art, but extends to all Persian Islamic painting. For example there are similarities between paintings (dated 1037) in Duvazdah Imam at Yazd in Iran and those paintings at Bezeklik and Toyuk. The bas reliefs found at Ghazni show scenes of court life (courtiers, dancers...), hunting scenes (horsemen battling a lion...) etc. The hunting scenes are similar to that of a Sassanian theme; however they are distinguished by their refinement of drawing and fluidity of movement. 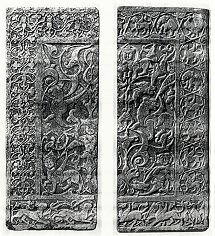 Ghazni, Rauza Antiquary, large decorative marble slab sculptured on both sides, 11th century. Ghaznavid art produced some of the most notable examples of calligraphy in Islamic art. The Kufic script was very popular, and achieved its most elegant form during the reign of Ibrahim (1059-99). This script with ornamental border remained the fashion for centuries in various Persian provinces. Little is known of Ghaznavid art to fully appraise this heritage, and its historical importance consists principally in the legacy that it transmitted to the Seljuks.